At these spots, the Nordic skiing is as good as the lunch menu. IF YOU GET lunch at Snake River Brewing, it will be one of the best lunches you’ve ever had at a brewpub, especially if you go for the Brussels Caesar followed by the Thai peanut pasta. And then there’s Picnic, the edgy sister-café to adorable Persephone Bakery. Picnic’s lunch menu changes, but might include the “T-Day Sub,” a baguette stuffed with turkey meatloaf, Utah Valley cheddar, balsamic red onions, Sriracha-spiked cranberry ketchup, spinach, and horseradish; it’s dessert menu is pretty constant and includes the valley’s best brownie and cookies. Go ahead and have lunch at both of these places, and then, when you have more time and are looking for a lunch experience, head to Turpin Meadow Ranch, Brooks Lake Lodge, or Dornan’s where the food is fabulous, and the Nordic skiing is even more so. As gorgeous as the views and the ski trails here are, it’s lunch and hanging out in the main lodge that are the highlights at Turpin Meadow. BUFFALO VALLEY’S TURPIN Meadow Ranch is exactly a one-hour drive from downtown Jackson, but feels a world away. The ranch, which was totally remodeled in 2013, originally opened in 1932 as a gas station and rest stop at the base of the western side of the first road over Togwotee Pass. The highway over Togwotee Pass has long since been replaced and rerouted, but the original road does still exist (it begins climbing up the pass directly behind the main lodge). In the winter though, it’s not plowed past the lodge, so the ranch’s cozy main cabin is literally the end of the road. A small ski shop at the ranch rents all the gear you need, whether you’re a classic or skate skier. 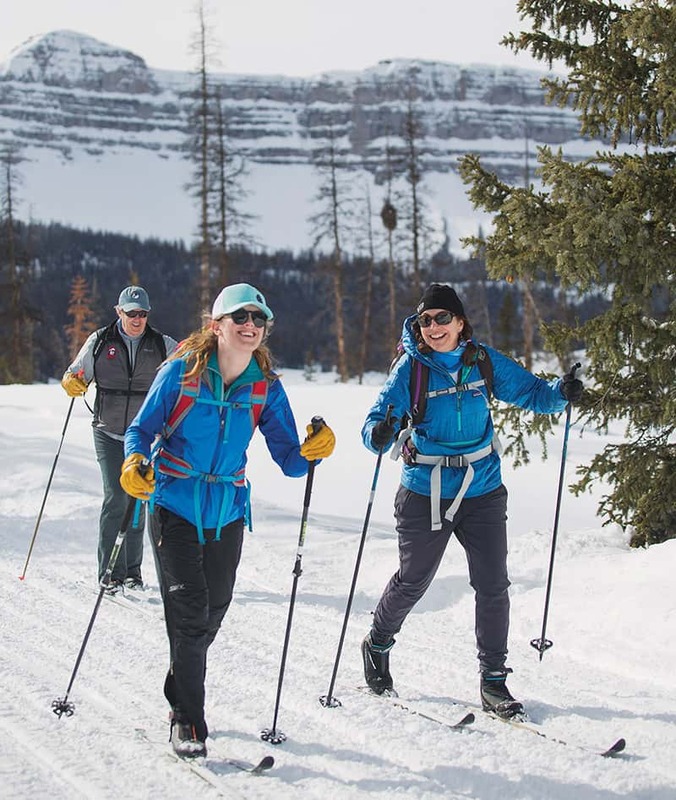 Geared up, explore the ranch’s 25 kilometers of trails, all of which are groomed daily. 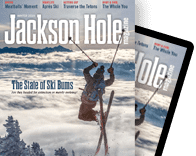 Jackson locals Hans and Nancy Johnstone, who both competed in the biathlon in the Albertville Olympics (1992) in France, designed Turpin Meadow’s trail system with the goal of appealing to all levels. They succeeded. The flat 3-kilometer Summer Homes Loop is mellow enough that even first-timers can look up from the ground every once in a while to enjoy the Tetons rising in the distance without falling. BROOKS LAKE LODGE, in the shadow of 11,516-foot-tall Pinnacle Butte in the Shoshone National Forest, was built over six months in the winter of 1922. At one point it was the biggest hunting/guest ranch in the country. The lodge was expanded (in the original style) in the 1980s. In winter, the only way to get there is via snowcoach, snowmobile, or cross-country skis. Even though it’s a longish ski to get there—5 miles each way, and uphill on the way in—Brooks Lake’s lunch, available to nonguests, is worth the effort. The skiing doesn’t start at Dornan’s, but about 4 miles up the road, at the Bradley-Taggart Lakes Trailhead. Here you’ll find a large parking lot with a vault toilet, and unless we’ve gotten so much snow that it’s buried, a metal gate across the road. From the trailhead, you can follow the groomed road for as long as you’d like and then turn around, or explore smaller trails that aren’t groomed but are made by other users after each snowstorm. The easiest of these will take you to Taggart Lake, about 1.5 miles from the parking lot. If you’re up for a little bit of climbing, head for Bradley Lake, which is over a several-hundred-foot ridge to the north of Taggart. You can get to Jenny Lake via the groomed road or a smaller, user-made trail. The latter will be about 1 mile shorter than the former (about 5 miles instead of 6). Both options are flat. If you take the groomed road to its end, you’ll find yourself near Signal Mountain Lodge. Don’t look for lunch here though, it’s closed in the winter. But that’s fine because you want to eat at Dornan’s.